This book presents a strong case for substance dualism and offers a comprehensive defense of the knowledge argument, showing that materialism cannot accommodate or explain the 'hard problem' of consciousness. 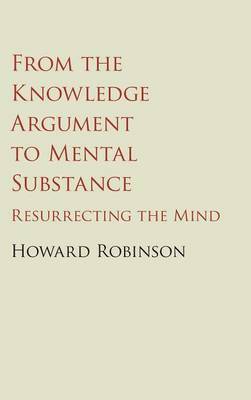 Bringing together the discussion of reductionism and semantic vagueness in an original and illuminating way, Howard Robinson argues that non-fundamental levels of ontology are best treated by a conceptualist account, rather than a realist one. In addition to discussing the standard versions of physicalism, he examines physicalist theories such as those of McDowell and Price, and accounts of neutral monism and panpsychism from Strawson, McGinn and Stoljar. He also explores previously unnoticed historical parallels between Frege and Aristotle, and between Hume and Plotinus. His book will be a valuable resource for scholars and advanced students of philosophy of mind, in particular those looking at consciousness, dualism, and the mind-body problem.